Okumura was born in Kyoto in 1953, and was thus from an early age inducted into the avant-garde world of pottery being created at that time by the founders of Sodeisha and their influence. 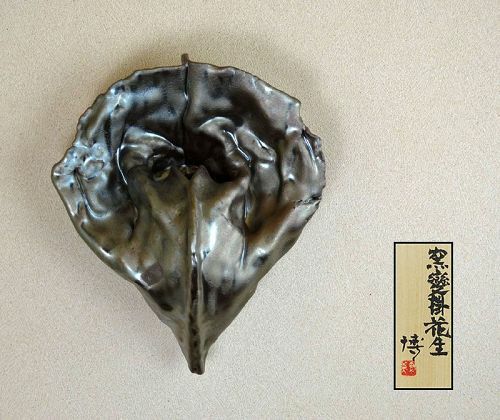 He graduated the Kyoto Municipal University of Art Ceramic division in 1978. Throughout the 80s a slew of public and private exhibitions led him to an appointment as professor of Ceramics at Kyoto Seika University. He received Grand Prize at the Kyoten in 1990, and has since received other awards there. His work was selected for the traveling exhibition showcasing young Japanese talent “Japanese Pottery: The Rising Generation from Traditional Japanese Kilns”. He has been exhibited frequently in America as well.